Lately, it seems there have been many tragic, unfortunate electricity accidents. Most times, these accidents can be prevented with the right knowledge and respect of electricity. Learn more about electricity safety to keep you and those nearby safe and shock-free. First of all, it is important to note that electricity is dangerous by nature. Given this danger, it is always best to trust a licensed professional. Electricity takes two forms, either “static” or “dynamic.” Static electricity is accumulation of charge on surfaces as a result of friction with another surface. Dynamic electricity is the uniform motion of electrons through a conductor. Conductors are materials that allow the movement of electricity through it. Most metals are conductors, but the human body is also a conductor. Did you know a task as simple as changing a light bulb without unplugging the lamp can be hazardous? In fact, the voltage of electricity and the available electrical current in regular businesses and homes has enough power to cause death. Simply coming in in contact with the “hot” or “live” part of an electrical socket could kill a person. Install Ground Fault Circuit Interrupters (GFCIs) as they will interrupt the electrical circuit before a current sufficient to cause death or serious injury occurs. Always use the correct size fuse. Look out for unusually warm or hot outlets. This may be a sign that unsafe wiring conditions exists. Do not use these outlets until they can be professionally inspected. Always tape, don’t staple or nail, extension cords to walls or floors when necessary. Inspect portable cord-and-plug connected equipment, extension cords, for damage before each use. Do not use anything if it seems to be worn or damaged. Risk of electric shock is greater in areas that are wet or damp. In case of emergency, know where the panel and circuit breakers are located. Be sure these panels are accurately labeled as well. Each switch should be positively identified as to which outlet or appliance it is for. 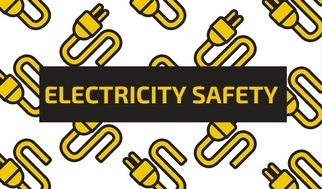 Safety is something our team at TRS prioritizes and wants to share with our customers, and as previously mentioned, it is always best to trust a licensed professional when it comes to electricity. It simply isn’t worth the risk – be safe, not sorry. For more tips like these, follow our boards on Pinterest! At TRS, we are happy to provide a product called Nu Drain. Nu Drain is Nu Flow’s leading structural lining technology. Not only can it act as a stand-alone pipe within a pipe, but it enhances the structural strength of the host pipe as well. 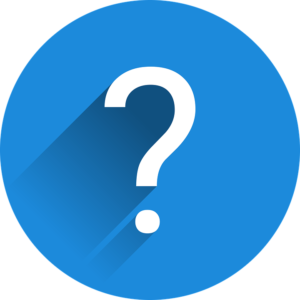 With the help of Nu Flow, we are answering some common Nu Drain FAQs below. Have questions about Nu Drain? We’ve got you covered! How can I tell if there’s a problem with my plumbing? Common indicators of failing drain lines are cracks in the visible pipes, leaks, water stains, mold, slow drains and backups. What types of pipe systems can you line? We have the technology to line the following mechanical pipe systems: vertical sanitary stacks, horizontal sewer lines, mains, roof drain systems, processed piping, conduit lines, fuel lines and chemical lines with diameters 3/4″ to 12″ and bigger in some specialty applications. How long have you been doing this? Nu Flow’s structural liner and unique pull-in-place process was developed in the 1990s and has been used on thousands of skyscrapers, commercial buildings, multi-unit residential complexes, houses, federal structures, churches, schools and other buildings. Why should I line my pipes instead of repiping them? A repipe is a traditional means of repair where a plumber will remove the failing pipe and replace it with a new pipe. This repair method has many disadvantages, which include the creation of a messy construction site, high time consumption, fact that the new pipe is doomed for the same failures as the old pipe. Nu Flow’s in-place pipe lining solutions are non-destructive, eco-friendly, non-invasive, cost-effective and can be installed in a fraction of the time. Nu Flow’s patented processes utilize pull-in-place technology and blown-in technology that only require pipe access points (clean outs that should already exist for maintenance). The epoxy liner is pulled into place and then left to cure, so there is no damage or disruption to the building, tenants or residents. What is the lifespan of your liner? Test results show that our Nu Drain epoxy’s life expectancy to be more than 50 years. How much access is needed to rehabilitate a pipe line? The access points, cleanouts and manholes we utilize are already present. How many hours does the epoxy take to cure? It takes less than a day for the different epoxies to cure, depending on length and temperature of the pipe. How long does the water need to be off? With some drain applications, the pipe systems don’t even need to be turned off. If necessary, the pipe system can be worked on and nonfunctional during the least inconvenient hours for the building. Is your pipe lining safe? Our epoxy meets or exceeds the physical properties set forth in ASTM standards for CIPP rehabilitation. Want to know more about Nu Drain or want to know how TRS can help strengthen your pipes? Contact us today. We’d be happy to tell you more! It is important to understand the components of your potable water plumbing system to keep the water flowing! Typically, potable water lines consist of straight lines of pipe with various fittings to change the direction of the pipe or connect additional pieces if necessary. When something does go wrong, we can often make repairs with something called an epoxy coating. Epoxy coatings are used to seal holes and cracks and prevent further pipe corrosion. Find out more about your potable water plumbing system below! Find out more about your potable water plumbing system! As mentioned previously, in general, potable water lines consist of lengths of straight pipe. These lengths can be either long or short and can be made out of different materials. Unfortunately, all pipe materials can pose potential problem, but both metal and plastic straight pipes can be lines with an epoxy coating. A tee section is a type of fitting that connects pipes at a right angle. While tee sections can be manufactured from the same materials as straight pipes, they can become corroded over time causing cracks and holes. Epoxy coating can be used to make tee section replacements. An elbow is another type of pipe fitting, typically indicating a directional change. These elbows can be made from different materials and come in various sizes. There are some circumstances where epoxy may be a solution for holes or corrosion, but the best solution is usually to cut the fitting out and replace it. Brass and gate valves control the flow of water. When this valve does not turn on or off completely, it can cause a leak and potential damage. This typically calls for a replacement of the valve. Additionally, a gate valve is above ground and our trenchless experts can replace this valve with minimal damage. 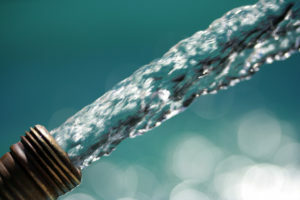 If you’re afraid you may have a leak in your potable water plumbing system, contact TRS today! Our technicians can examine your pipes to determine if they can be restored using an epoxy coating or if they require a replacement. Find out today! You’ve heard about trenchless technology and about the various services we offer. But why choose trenchless? Check out the benefits below! 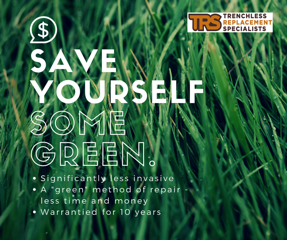 Cost savings – So often, people forget about the various costs associated with repairing your home or landscaping after trenching (drywall, new flooring, grass, plants, etc.). Why give in to those additional costs if you don’t have to? No digging involved – No digging means no mess or trenches on your property! Significantly less invasive – Think about the holes and trenches involved in traditional digging methods…yuck! Choose the less invasive option! Less time and inconvenience – Consider the inconvenience of digging up your yard or flooring to get to an underground pipe. There’s not much you can do around your home without a floor! Don’t inconvenience yourself or your family more than you have to. More options for pipe shape/material – Want to use a certain type of pipe? Maybe it needs to be able to direct a certain way? The options are endless with trenchless! A “green” method of repair; as it consumes less time and resources – Even if you’re not a person who typically “goes green,” why not save yourself the resource and time consumption? Wide range of damages can be repaired (animal activity, root growth, foundational shifting, faulty installation, etc.) – What’s your pipe problem? Our trenchless technology offers the solution! More cost-effective in the long run, as trenchless jobs can service your home for decades to come (think patching as opposed to fixing a problem) – Why put a band aid on the problem when you can fix it and save yourself the time and money later? Warrantied for 10 years – We’re proud to stand behind the work we do and warranty our work for 10 years. Ditch the mess, call TRS! So ditch the mess and call TRS today! You’ll be glad you did. In fact, we’ll see if you qualify for a free video inspection…a $300 value! Contact us online or call 432-580-7693! home! But let’s be honest, who has the time to spring clean? Don’t worry; we’ve got your back! 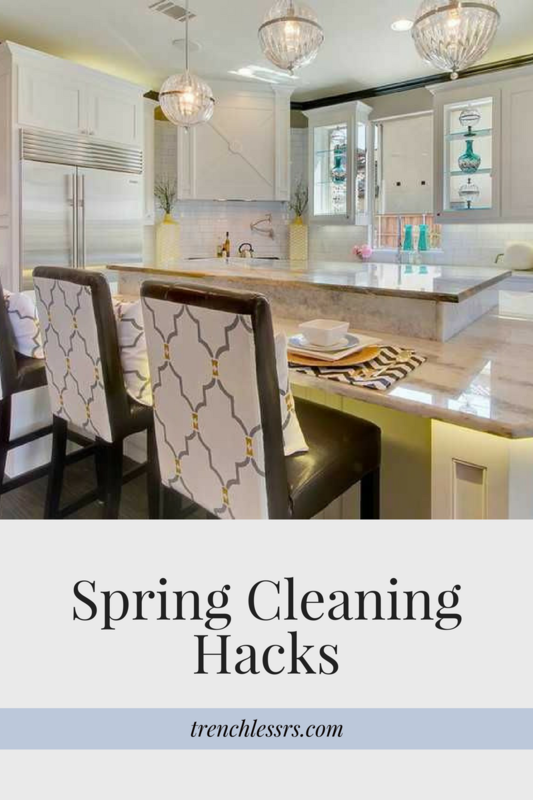 Have a look at our spring-cleaning hacks! Curtains can get awfully dusty over the year…especially in West Texas! Remove fabric window treatments and tumble them in a cool dryer for 15-20 minutes. While the dryer is freshening your window treatments, dampen an eyeglass-grade microfiber cloth with water and use it to clean windows for a streak-free shine. Use a regular microfiber cloth over the woodwork trim. Move furniture out of the way and replace it as you vacuum the room (don’t take the time to move it all beforehand). For rooms with area rugs, just roll up the rugs and vacuums beneath. For rooms with wall-to-wall carpeting, use the edger vacuum attachment to clean the space between the baseboard and the floor. Try using the long-bristle attachment on your vacuum to clean your baseboards. For quick, deep cleaning on hardwood, tile, vinyl and laminate floors use a steam-cleaner; it’s a perfect tool for pulling up dirt and melting away grime! For ovens without a self-cleaning feature, prepare a paste of water and baking soda. Apply it to the inside walls and floor of the oven, and spritz vinegar over it. Wipe it away after it sets for a couple of minutes. Wipe off the top of the refrigerator with a water-dampened microfiber cloth. It is also best if you can move the refrigerator away from the wall and clean the coils with the brush attachment on your vacuum. Doing this will not only help your refrigerator run more efficiently but also save money in energy bills! Add non-abrasive cleanser to a damp microfiber cloth and run it along the inside rim of the dishwasher door. This will eliminate any food and scum buildup. Hopefully, these spring-cleaning hacks help get you started with your spring-cleaning chores! For other tips and tricks like these, follow our boards on Pinterest! When you hear “spring cleaning,” you may think of boring household chores such as washing windows or scrubbing floors. What about your pipes? They’re often forgotten, but deserve a “spring cleaning,” too! Find out just how to spring clean your pipes! Find out how to spring clean your pipes! To ensure proper flow, run water down all drains. If you hear any noises or if it seems like water is flowing slowly, snake the drain to make to ensure water is able to freely move through. To prevent clogs in the future, try adding strainers to all drains. To check your sinks for leaks, fill the sink up all the way with water, then let it drain all at once. The large amount of water running through the drain will help identify leaks that may not be seen otherwise. Similar to cleaning drains, pay close attention to the sounds you hear as the water drains. Any “glug glug” noises may indicate a problem with venting. Examine the exposed pipes under the sink for puddles or drips. If the toilet handle has to be held for a long period of time, it may be time to replace worn tank parts. However, these replaced parts can result in a lower water bill! Also, be sure to check for cracks or leaks in your toilet bowl. If you have gutters, be sure they are debris-free. 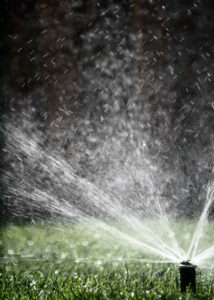 Using a hose, run water from a space far from the downspout to clear finer debris. Spring cleaning your pipes is a good way to not only extend their life, but also to catch any minor problems before they become major problems. For more information on pipe health, or if you’d like to see if you qualify for a camera inspection, contact the trenchless professionals at TRS today! Learn these symptoms of an underground water leak to avoid damage to your home! As you can imagine, you really have to have an ear for the sounds above to use these as a proper indication of an underground water leak. In fact, the sound is dependent on the pipe’s water pressure to a certain limit, so you may not even hear anything at all. 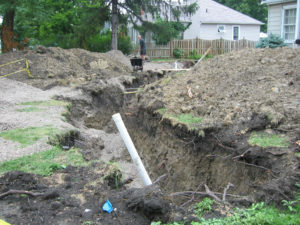 Being aware of the symptoms of an underground water leak could stop a disaster that could potentially damage your home. If you suspect you may have a leak, it’s important to take action right away. Contact the professionals at Trenchless Replacement Specialists to see if you qualify for a camera inspection…normally a $300 value! Our trenchless services could save you from having to tear up your lawn or floors. Contact us to find out more! Love your pipes by maintaining them! It’s the season of love. Valentine’s Day is almost here! 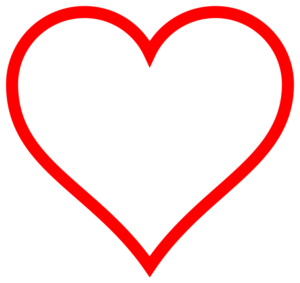 Show your pipes some love this Valentine’s to save money in plumbing emergencies later. Check out our ways to maintain your pipes! The best way to prevent clogs and maintain your pipes is to be conscious of what you’re actually putting down your drains. Install screens over drains in showers and tubs and scrape food into the trash before doing dishes. Keep this rule of thumb in mind when using your disposal: if it can’t go in your body, it shouldn’t go down your drain (egg shells, coffee grounds, grease, etc.). Sometimes, chemical drain-clearing products do more harm that good (they can actually erode cast-iron drainpipes)! Since these chemicals don’t typically remove the entire clog, the problem is likely to reoccur. 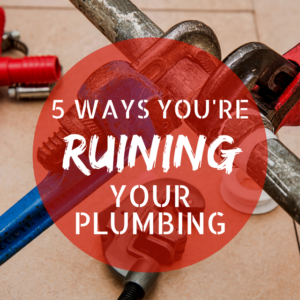 It’s best to hire a plumber to clean the drain and remove the blockage that’s plugging the line. 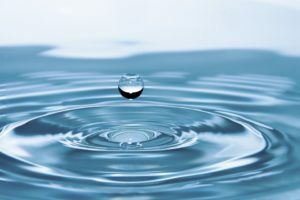 High water pressure reduces the life of your plumbing. To know if you’re putting too much pressure on your pipes, measure it with a hose bib gauge (available at hardware stores). If the pressure is above 85 psi, consider installing a pressure reducer. You guessed it. Hard water can shorten the lifespan of your pipes. The only way to effectively soften your water is to install a water softener. However, this can benefit more than just your pipes. Softer water is better for laundry, skin, and dishes, too! One of the best ways to maintain your pipes and prevent damage is to have your main sewage cleanout cleaned every few years. This will remove tree roots and other debris that inevitably build up and lead to sewage backups. For more information on how to maintain your pipes, or if you would like to have one of our trenchless professionals come inspect your pipes, contact TRS today!